Scrangie: New items for fall at Sephora! Nails Inc. 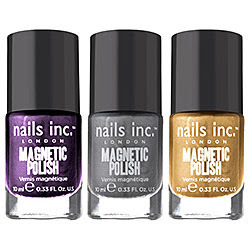 Magnetic Polish trio. More magnet polish! This is like a dream come true. I'm dying to try these but they're not in stock! Shades are: Houses of Parliament (purple),Trafalgar Square (chrome), and Big Ben (gold). 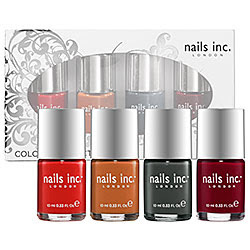 Nails Inc. Color Collection Autumn. These look so gorgeous together. Especially that orange! Shades are: Charing Cross (classic red), Fenchurch Street (warm caramel), Paddington (dark smoky gray), St. Pancras (burgundy wine). 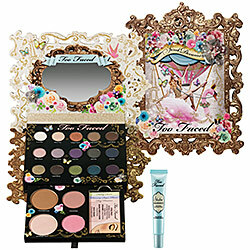 Too Faced Sweet Dreams Makeup Collection. This looks awesome. Crazy design and lots of cool items! I loved my palette from them last year. ULTRAFLESH Perfect Pinks and Perfect Reds 6-Piece lipstick sets. I've been wanting to try something from Ultraflesh and these look really cute. Tiny lipsticks! 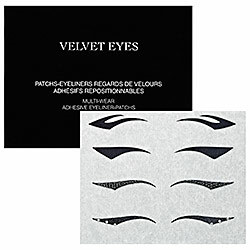 These Dior Velvet Eyes Backstage Eyeliners-To-Wear Multi-Wear Adhesive Eyeliner Patches look awesome, but they're really freakin' expensive. Still, I've never tried an eyeliner sticker before... Wonder if they work well? 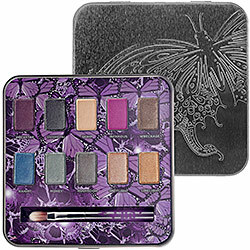 Urban Decay Mariposa palette. I can never resist an Urban Decay palette. Especially one in a cool tin. 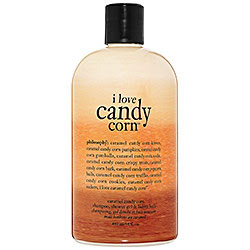 Philosophy I Love Candy Corn Lip Shine and 3-in-1 Shampoo, Showergel and Bubble Bath, and Trick Or Treat Set. Philosophy always makes awesome stuff for fall. I already have a lot of the new fall stuff from them (Autumn Air, Harvest Spice, Trick Or Treat Lip Shine Duo...) but I still need these! Anyway, I thought this stuff looked cool. Just wanted to share. My Sephora.com 'shopping list' is so full it won't let me add any more items, haha. I love that feature but they need to remove the limit of items you can add! The magnetic polishes are nice,but where's the magnet? Can't wait to see the polishes!! Can you hear the money escaping from my bank account?? I can! Magnetic polishes would be so awesome! I hope I can find them. And as much as I love Halloween and Philosophy products, I can't get behind candy corn scented things. Ew! Those liner stickers are intriguing. I got the Sephora email announcing them and kind of wanted to buy them, but I hate being the guinea pig lol. Some of these items, such as the Too Faced & the Urban Decay are Holiday items, not fall. The Holiday season came a bit early this year, considering it's still so hot in California! I have the candy corn 3-in-1 and lip shine, but the lip shine smells like marshmellow. It is the marshmallow from before just repackaged. It smells better than the candy corn to me. Ohh the UD palette looks amazing! I'm still wanting those other magnetic polishes that you posted up a bit ago! The only thing that kills me is the price tag. The eyeliner stickers sound like a horrible idea (sort of like those lip tattoos). I mean everyone has a different eyeshape and size and I could just see that being so hard to get it perfectly aligned better to practice applying eyeliner myself I'd wager. Wahh there are so many good polishes out this winter/fall!!! The candy corn 3 in 1 smells amazing! I got it at Ulta the other day. I just love palettes! I'm so tempted. Darn that I have to get another crown on my tooth. It's exciting to see more magnetic polish, but those colors aren't jumping out at me - I have ones similar from the LCN set.